At Hemp Sisters, fair trade is fundamental to everything we do. Is it the basis of our business and our primary purpose of doing business. We are a small company, and we contract out many of the internal operations such as warehousing, packing and shipping, accounting, and first level customer support. As owners of Hemp Sisters for the last four years, we have never paid ourselves a salary or taken any money out of the business. Our goal is to provide a great product at a great price and provide the highest level of customer service. We know that the people that make the items for us come first. We do everything we can to help them in as many ways as we can. Today we work with small, women-owned businesses and working women’s cooperatives in Kathmandu Nepal. Eventually we hope to work with similar groups throughout the developing world. We work directly with the people that make the items. We visit Nepal once or twice a year and learn as much as we can from them about materials and fittings, production methods and constraints, and design capabilities. We provide item samples to assist with new designs, we help source fittings such as buckles and zippers, and we share customer feedback in an effort to improve the overall quality. We work directly with the people that make the items and we pay them directly. Other larger companies, because of their size, frequently use a middleman and are not able to have the close working relationship with the community that we have. A major factor in our opinion of what is fair trade and what is not, is the effort required to work directly with the people that make the items and to pay them directly so the money is going in their pockets and not someone with a nice website. The price we pay is based on the time it takes to make the item, how complicated it is to make, and the material costs. A coin purse is much easier than a backpack or handbag, and many more can be made in an hour. We know that the rates we pay are at least 25% to 50% higher than what the person who makes the item would make if they were working for someone else or working in a factory doing a similar task. As a company, we have not yet reached profitability, but when we do, we will contribute back to the communities that we work with at least 10% of the profits that we generate. And one day, we might even pay ourselves a little something. 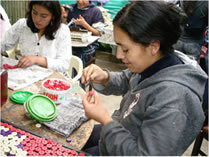 Fair trade is a system that not only aims to pay fair wages, but also to support participatory workplaces; ensure environmental sustainability; supply financial and technical support; respect cultural identity, offer public accountability, and educate consumers about the choices that they can make in their regular shopping habits. Fair trade businesses foster long-term and direct relationships with producers in the developing world, because they know these connections are a highly effective way to help producers help themselves. Fair trade is not about charity; it uses a fair system of exchange to empower producers and to create sustainable development. Is Hemp Sisters are Fair Trade Company? Yes and no. The items that we make in Nepal are Fair Trade. But we have lots of items on our site that are not fair trade. We have hemp food from Germany and Canada, some bath items made here in the USA and some twine from Hungary. But the majority of the items on our site, the hats and bags section, are mainly fair trade. We list “Fair Trade Made” on the website next to the items that are fair trade and include this on the product label. For the items we make in Nepal, we exceed the general criteria for fair trade. However, as a company we cannot be certified because we also sell items that are not fair trade made. The hemp food, bath, clothing, home and twine/craft sections of our site include items that are made by companies in Canada, China, Germany, Philippines, Hungary, Guatemala and in the US. The Hemp Sisters hats, handbags, wallets, coin purses, scarves, gloves and many other items made in Nepal are Fair Trade made. We work closely with working women’s co-ops and small, woman-owned cottage industry producers. We visit Nepal once to twice each year to help with new designs, sourcing materials, improving the overall quality of the fabric and the construction of the item, and to share customer feedback. Most of the effort goes into creating new designs. Most designs originate in Nepal. We also bring sample items with us to create versions out of hemp and other natural fibers. We work with several different organizations in Nepal, depending on the type of item. One lady makes our slippers. Another makes the recycled silk scarves, hats and gloves, another produces crocheted hemp handbags and hats. The most important thing is that we work directly with the people that make the items. We go to their homes where the items are made. We help them select fabric and materials that are consistent in color and texture. We help them source buckles, snaps, rings, zippers and other closures that are difficult to find in Nepal. And we learn a great deal from them about what they can do and cannot do. We’ve also learned to go with the flow… we often receive product that is not up to our hopes of what it could look like. Some times some items look great and others don’t. We try to go through and pull the items that could have been better, and then we put these on sale with a note in the description…”This item does not match our quality standards.” We have made incredible strides in the last four years in terms of quality. This has been a huge benefit to Hemp Sisters, but it also a huge tribute to the artisans of Nepal who work so hard to make the items as perfect as they can. Each item is handmade and is a reflection of the person that makes it. They have such pride in what they do and they love when I provide customer feedback about how great our products are. They also take it very personally when things are not as good as they could be. But it is really a neat feeling to see the level of improvement in each shipment, or with each new design. We have come a long way since we started and things will only get better. We now are at the point where we feel it is time to start working with other communities outside of Nepal. We are actively exploring different options and contacting different groups and hope form a relationship with a new community soon. Is Hemp Sisters certified fair trade? We applied for certification with the Fair Trade Federation: FTF.org. We were denied because we sell other products on our website that are not fair trade and have some items under the Hemp Sisters name that are not fair trade, such as soap and lip balm made in the US, as well as a our jewelry kit, which has components from all over the world. To address this, we are creating a new brand called Earth Divas that will only be for handmade fair trade items. It will take us some time, but eventually, the Earth Divas name will be our brand for Fair Trade and Hemp Sisters will be a website that sells all things made of hemp. If you would like more information about our products or how they are made, please email us at info@hemp-sisters.com. We will be more than happy to answer any questions or provide additional information.